Our shuttle bus rumbled through the dark up Interstate 17. The hundred-plus miles north from Phoenix to Flagstaff, Arizona, is a prototypical ecocline–a gradient of ecosystems—first, saguaro cactus and teddy-bear cholla, then red-rock cliff country, and finally into Ponderosa pine forest. Though I couldn’t see out into the night, I knew what was there both from memory and from the feel in the air, so different from just a few hours earlier, in Eugene, Oregon. I left Eugene in mid-April, before our crazy premature summer had arrived. It had been uncommonly dry all winter, but that day was a typical Pacific Northwest rainy-sunny-windy smorgasbord of a day. I had watched hail gathering in our house gutters before we left. Then winds blew the pile of gray clouds, exposing a sky of robin’s-egg blue. On the way to the airport I donned dark glasses against the brilliance of chartreuse big-leaf maple flowers; willows, maple and ash trees in spring green foliage; and emerald meadows, all glowing in the sun. Grass was already nearly knee-high; the entire valley, verdant and lush. Before we reached the airport, swishing windshield wipers whispered the return of the rain. The flight to Portland was in a little prop plane, with a motor that sounded like a sewing machine. We flew among solid-looking flat-bottomed clouds—a flying fish among a school of flying whales. Four hours later, in a much larger plane, I descended toward Phoenix at sunset. The cloudless deep-blue bowl of sky, growing deeper still, was banded by a long, curved, vibrant sash beginning with the faintest touch of green blending into yellow, the yellow growing more fiery to orange and then an intense scarlet at the horizon. Below was a carpet of soft black. Dropping near the city, I was delighted to see lidded city lights illuminating the streets and sidewalks with minimal trespass into the night sky. Then at midnight, I stepped out of the bus into Flagstaff’s twenty-degree star-studded night with the feeling that I’d emerged instead from a dehydrator, my nasal passages, lips and skin sucked dry. But the air was clean, cold, and lovely to breathe. Erika and Bob, our daughter and son-in-law, and our granddaughters, Tasha and Camila, live next to national forestland. When the girls are in school and Erika and Bob are off to their University jobs, I snuff up some saline nasal spray, slather on moisturizing lotion, grab brimmed hat, sunglasses, and water bottle, call the dogs and head out. In my snobby northwestern way I once expected a forest to be dark with trees, and mountains to be topped with snow year around. But I’ve long since learned to appreciate the spare beauty that is a northern Arizona national forest, and though I’m loathe to call it a mountain, I love to explore the immense boulders that make up Mt. 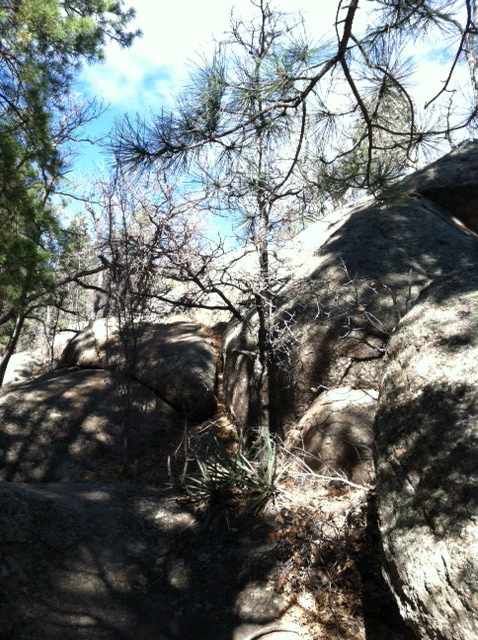 Elden, a dacitic lava dome, just a few hundred meters from the back door. To my eyes, trained in shades of green, the ground initially looks bare. But though it is tan, dusty and rocky, green shoots emerge from centers of dry grass clumps and scatterings of ground-hugging herbaceous plants promise flowers in another month or two. Ancient junipers, their alligator bark interrupted by branches of smooth, silvered dead wood, testify to the trees’ adaptability through long, hard lives. Nearby, colonies of twisted silver stems look lifeless. But looking closely, I see swelling buds that will be oak leaves, or sprouts of small, leathery, dark green leaves of mountain mahogany, or on yet another group of silver stems, smatterings of green along with remnants of the flowers of a cliff-rose. A few ponderosa pines tower above it all along with as many barkless snags. Young conifers sprout between boulders where enough dust and debris has seeped to give a seed a nursery bed. I marvel at the toughness of all of these survivors—the tenacity, the adaptability these plants must have to live long and well in their dry world. I love it here: Love to gaze at the boulders, imagining their formation as the slow-moving, silica-rich magma accumulated; love to sit on a dead log and watch the squirrels, listen to a woodpecker, admire a two thousand-year-old juniper. But as I snort a bit more saline solution and take a swig from my water bottle, I wonder how long I could survive. Channels show where water occasionally cuts through the soil, mostly snowmelt from the boulder buttes, but now those channels are dusty dry. Plants here conserve water of necessity. The healthiest of them are widely spaced, not infringing on their neighbor’s water rights. Few and scattered plants gave me my early impression of “barren.” But in fact there is much life here. They just know how to make it work. Yet people flock to this dry climate, mostly to the Phoenix area, where it is on average thirty degrees warmer than Flagstaff, and much drier. How will they, who, unlike the plants, do not favor wide spacing, compete for water? Eugene’s average temperatures are between Flagstaff’s and Phoenix, though closer to Flag’s. Our average rainfall, at over four feet, is more than double Flagstaff’s, which is in turn about three times Phoenix’s seven-plus inches. Phoenix has, on average, 167 days above ninety degrees. And people like that?! By the time I returned to Eugene, it seemed to have forgotten how to rain. We are now fifteen inches behind the average precipitation for the year to date. Skies are sunny and blue almost daily. Will people begin migrating to our beautiful climate? Will they live close together and fight over water? Will the grass turn brown and the trees begin to die? Given my choice, I’d rather visit Flagstaff, and welcome the rain in Eugene. This entry was posted on Saturday, May 18th, 2013 at 4:50 am	and is filed under blog. You can follow any responses to this entry through the RSS 2.0 feed. You can leave a response, or trackback from your own site.